This is a step-by-step process. You don't have to follow this exact order, but it will be easier if you do. The instructions below are specific to our basic 3- or 4-Stage Q Series systems. If your unit is slightly different, you may have to improvise or call for instructions. For a 3 Stage Unit, replacing one cartridge: Looking at the unit from the front, remove the prefilter (on the left) and discard it. Move the postfilter to the prefilter position. Put your new cartridge in the postfilter position. 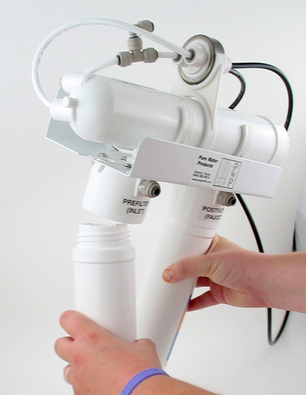 For a 4 Stage Unit, replacing two cartridges: Looking at the unit from the front, remove the left (prefilter carbon) and center (prefilter sediment) cartridges. Move the remaining cartridge from the far right to the far left. Put a new sediment filter (Q5605) into the center position and a new coconut shell carbon GAC (Q 5640) into the right position. Just remove the old cartridges, remembering the order they were in. The cartridges will screw off of the caps easily. Replace with the new cartridges. Go on to step 5 if you're not replacing the membrane. Remove the tube that enters the cap end of the membrane housing by pressing in on the small ring (the “collet”) of the fitting and pulling out the tube. Unscrew the cap, then remove and discard the old membrane. When the cartridges have been replaced, open the inlet valve part way and let water slowly enter the unit. Check for leaks. If everything seems OK, open the inlet valve completely. It's normal to hear lots of gurgling and air escaping down the drain. Next, with the ledge faucet open, open the valve on top of the tank. After a moment, water will come from the open faucet. It's normal for black particles (called carbon fines) to come out of the faucet. Let the tank drain completely — this may take some time. It will finally become a fast drip or a small stream. This is the rate of water production through the membrane. Tip: Don't empty the storage tank before you change the cartridges. This step is necessary to rinse the new postfilter. When the tank is aired, close the faucet and let the unit refill. You're through. You'll have enough water to use in a few minutes, but it may take a couple of hours for the tank to fill completely.